If you are looking for 100% handmade quality one-of-a-kind bridal and fashion accessories made in the USA - you are at the right place! Each accessory in my store has been crafted by my hands with love and extreme attention to each detail. Each design is my own creation. You are very welcome with your own special requirements and wishes! Now we also have READY TO SHIP section where you can pick ready to go items if you are in rush!! MarkaDecor Studio creates quality Handmade Accessories and Gifts. If you have any additional questions, please contact us through the message in the Seller section. READY TO SHIP orders placed today will be shipped within 2-5 business days. All other orders will be shipped in about 4-8 weeks. Hair Accessories, Wedding Cards, Garters usually ship within 7-10 days. Custom Clutches and Custom Umbrellas usually ship within 6-10 weeks. Some of the our bestsellers (popular products), including umbrellas and clutches we usually have ready-to-ship. Please, ask about an availability. Large orders, custom orders, your special orders can take more time, especially in the spring and summer period. If you require your order before that time frame, please ask for your apprx. shipping date prior to ordering. We'll discuss whether it can fit into the production schedule or if a rush order is needed (rush fees may apply). Usually, order is considered as RUSH if it needs to be created and sent earlier than 10-12 days. Every item in our store is Custom Made. If you’d like to add a Custom Nameplate to your item ( guest book, card box) or Tag to your favor boxes, or personal Set of Tags or even Custom Seal your invitations – just send me convo. If you require to personalize your item with a different option – just let me know and we discuss. All payments are due within 2 days. If payment is not received within the 2 days orders will be cancelled, unless you contact us, to inform about your payment plans. Working process on your order starts only after payment is made in full. We do combine shipping charges if multiple items are ordered. We include a delivery confirmation within US shipping. Insurance for all international and domestic packages is optional for all items (for additional fee). Please, ask for the rate. Garters, boutonnieres, small favor boxes, guest books, sashes, clutches, sitting and table cards, greeting cards, ring pillows usually ship via USPS First Class Mail. Candles, glasses, bouquets, baskets, card boxes, sets, usually ship via USPS Priority Mail. When your order will be ready to ship you’ll receive a message. Most of US shipments arrive within 1-5 days. International shipments can take 3-7 weeks. I usually respond to messages within 3-5 hours after receiving them, but in sometimes it may takes up to 24-48 hours. Please, duplicate your message if you haven't received a respond within 48 hours. All designs in our store are property of Markadecor LLC. All projects are original work. Copying, reproducing,duplicating, performing, circulating or posting any images and designs is protected by copyright. Please ask for permission before publishing or distributing. I love my job very much! Every piece made by me and our designers handmade with love and care, with extreme attention to details. If you are happy with your order, please leave us a POSITIVE feedback with your comments and feelings. We like to read your comments and feel your happiness! Please contact me immediately if you are not 100% satisfied with your order or have some issues for any reason. If your item was insured and your order was damaged during the delivery, please contact me immediately so we can start a claim! I love to feature your beautiful happy pictures on our facebook page www.facebook.com/Markadecor and use your gorgeous photos for our listing (if you don't mind). I'd really appreciate if you share with us some photos with the accessories from your Big Day for our portfolio and listings. Thank you, it's a perfect size and the quality is very nice! Our gorgeous bestseller! 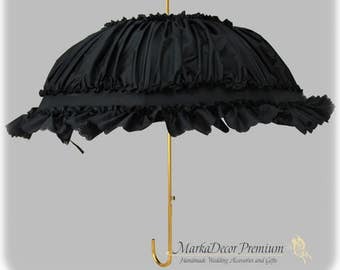 Large lace umbrella. I began sewing when I was in the fourth grade, and this hobby eventually blossomed into a passion. My first creation was a New Year party dress. I was 11 years old. I love different textures/colors of fabrics. Love flowers and ruffles, love natural and eco materials, beads and pearls. Love to wear my handmade jewelry, bracelets, fabric flower brooches, bag accessories. Love my handmade fashion accessories. Love tools and materials! Love my new sewing machines and we finally purchased a professional embroidery machine so in 2016 I'll be able to create a personalized. Before I left my full time job I studied craft materials, tools, different techniques a lot. I tried and tried and tried... In 2009 I have received my first order for 111 greeting cards and about 100 candle decorations. In the end of 2009 I finished the process of finding quality suppliers, purchased materials, tools and organizers, quit my full-time job and founded my own business in Europe. Mostly, I purchase materials from European (not China!) companies (United Kingdom, Germany, Netherlands, France, Italy, Finland, Sweden), Russia, Thailand, Canada and USA. We use only professional tools and the latest techniques from all around the world to create your accessories and gifts! We use lots of brooches and handmade flowers to create Luxury collections. For our Economy collections we gently tie flowers into beautiful boutonnieres. I graduated from two universities and worked as a choreographer and a manager at the same time. - As a manager who worked and working with TOP persons for more than 15 years I used to work with the highest quality of everything. I know that quality of projects, especially handmade projects, is the most important thing. That is why each accessory in my store is of the highest quality. - As a choreographer I know that everything should be cozy and comfortable to wear. - As a human I love beautiful one-of-a-kind heirloom accessories! Great customer service is how I work. If you have any questions - just send me a message. I usually answer convos within 6-24 hours. I moved to United States and I established Markadecor LLC in 2012. I have studied English for about 3 years only that's why sometimes you can see mistakes in my product descriptions. I am so sorry for that. I am still studying and improving my English. Feel free sending messages with my mistakes if you find one. I'd really appreciate it! I am so grateful to you, dear customers, for your endless support. Thank you for letting me do what I love! Each accessory in my store has been created with endless love! I love my job so much and I always opened for something new! My lovely husband. He is the best critic and a realistic person who inspires me to move forward every day. Our Studio has been made by his hands! He is our computer genius who can fix everything within minutes! Our beautiful model, my best friend and my Made of Honor. Love how professional she is! Markadecor LLC is an Art and Craft Studio. We have already decorated more than 4500 weddings all around the world. Our Studio and Store are located in the United States, Georgia. Welcome to our world of dreams and beauty! All of our products collections are designed by Taenkova Marina and our team of designers. 1. Our Premium segment contains exquisite collections, including handmade crafted products with one-of-a-kind statement jewelry and accessories. Each piece is individually designed with extreme attention to details and created using only the finest of materials. 2. Our Econom segment contains collections, including products crafted with boutonnieres and accessories. We use only high quality materials and "experienced hands" to make the beauty. - Handmade Bib necklaces etc. We have more then 100 colors of ribbons and fabrics. Our wedding accessories and handmade gifts are exclusive and different, we use the materials from all over the world, we work using only professional tools. We can make all of the accessories and gifts with your colors and theme, a single item or a completely color coordinated ensemble. All you should do is to choose the colors and the style you want and if there's something you're looking for but cannot find, contact us and we’ll create a custom design for you. We can work with your colors and ideas to create exactly what you are looking for. Due to the nature of special occasion items, all sales are final. If you have questions or concerns, feel free to ask before you commit to buy, I will be glad to send you additional photos and answer any questions you might have. This is a customer's responsibility to check the order at the moment of delivery. We accept claims within 3 business days after delivery ONLY. We will fix everything if there was our mistake or error. I will issue a refund as long as the order hasn't gone to production minus a 40% restocking fee as I order supplies after the order has been placed + cancellation fees 4% + 0,2$ will be applied. If you purchased the wrong item in our store via Paypal or through the Direct Checkout - we will issue a refund (unless the order hasn't gone to production ) within 1-4 days after receiving your order minus cancellation fees (PayPal and Direct Checkout required to pay cancellation fees). We accept payment by PayPal, Credit Cards, Money orders, Checks & Etsy Gift Cards. You can use a credit card at checkout and it will go through PayPal. You do not have to be a member of PayPal to use this option. We start processing your order as soon as your Money Order/Check will be received and cleared. Please contact me if you choose these payment methods to make the necessary arrangements. Note: If you are sending a money order or check it must be issue by the postal service. We ship all of the orders to the address on your PayPal account, if your shipping address is different, please change it before placing your order . We will not be held responsible if I ship to the address in your PayPal account and it turns out to be the incorrect address, reshipment charges will be due. We do not accept address changes after the transaction is completed. We are not responsible for lost or stolen packages. Tracking information will be provided with all of the packages and once it left at the post office it is out of our hands. There is a Buyer's responsibility to pay all of the local/country taxes and custom clearance if necessary. We include a delivery confirmation + insurance within US shipping. Insurance for international packages is optional for all items (for additional fee). Please, ask for the rate. Shipping charges are based on actual charges plus the price of the shipping material used in packing your items. We try real hard not to over charge for shipping, we charge what is reasonable. Garters, boutonnieres, small favor boxes, sashes, clutches, sitting and table cards, greeting cards, guest books, ring pillows usually ship via USPS First Class Mail. Candles, glasses, bouquets, baskets, card boxes, sets, ship via USPS Priority Mail. Larger items are shipped Standard Post via USPS, small and flat items shipped via USPS First Class Mail, because it is a lot cheaper than Priority, unless you prefer to have your item shipped Priority, you need to contact us before making the purchase so we may adjust the shipping fee. Some of the our bestsellers (popular products), including umbrellas and some clutches we have ready-to-ship. Please, check our READY TO SHIP section http://tinyurl.com/l4qyg2x or ask about availability. Large orders, custom orders, your special orders can takes more time, especially in the spring and summer period. If you require your order before the shown time frame , please ask for your apprx. shipping date prior to ordering. We'll discuss whether it can fit into the production schedule or if a rush order is needed (rush fees may apply). Usually, the order is considered as RUSH if it needs to be created and shipped earlier than 10-15 days. Special orders are always welcomed. If you are looking for a special wedding item, just send me a message into the Seller Section with your requirements. Materials used to create your order sometimes can very a bit - depending on the current stock. Shade, Layout, Faded edge and such can be slightly different, but the final look of the item will be pretty the same. Also, because each element of your item has been made by hands there are NO THE SAME flowers or stamens, no absolutely the same layout or element placement - each item created in our store is unique. There is no 2 absolutely the same items. Your item will be very similar to pictured, but not the same.